"Investing with a long-term family perspective requires a deep understanding of both family and finance; Family Wealth Management addresses these two topics in a seamless fashion, providing a comprehensive reference and practical approach for families interested in preserving both lifestyle funds and legacy wealth through all types of investment environments." "Family Wealth Management provides a much-needed practical guide to the intersection of family and finance. 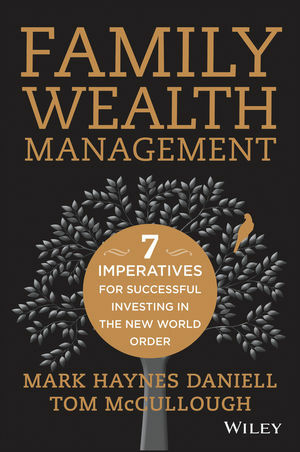 The seven imperatives and the many practical examples, case studies, and checklists will make this book an important reference piece for every wealthy family and the advisors who serve them." "Owning, managing, and nurturing significant wealth involves hard work, discipline, and engagement. This valuable guide puts the family at the core of the complex yet comprehensible web of decisions and disciplines needed to set a family's own successful investment strategies." "Finally! A book that puts family investors back in the driver's seat where they belong. This excellent book provides fresh, sensible thinking and a clear forward road map for wealthy families. This family-centric approach is very positive and long overdue." "Daniell and McCullough skillfully weave theory and practice to demonstrate how successful multigenerational wealth transfer starts with a family's vision and values." MARK HAYNES DANIELL is the founder and Chairman of the Raffles Family Wealth Trust, based in Singapore. He also chairs The Cuscaden Group, his family's own private office, also based in Singapore. He is a former director of Bain & Company, one of the world's leading strategy consulting firms, where he worked for more than two decades with some of the world's wealthiest families and their businesses. Mr. Daniell has also served as director of Wasserstein Perella, a mergers and acquisitions advisory firm in London and Paris, and was the founder and chairman of Singapore's national Private Wealth Management Initiative. TOM McCULLOUGH is Chairman and CEO of Northwood Family Office LP, a Toronto-based multi-family office which serves the comprehensive financial needs of families of significant net worth. Northwood was founded in 2003 and has quickly risen to prominence as an international leader in its field. Mr. McCullough has spent thirty years in the wealth management/family office field and is also an adjunct professor of finance at the Rotman School of Management at the University of Toronto where he teaches "The Management of Private Wealth."